The second movie in the Mission: Impossible franchise couldn’t feel more different to it’s predecessor. The first was a focused, intelligent spy thriller with a plot that kept you guessing and action scenes that worked for the story and complimented the style. The second movie is more in line with Michael Bay’s style of spy movie, with John Woo taking the film in a very different direction. This is apparent from the opening. Mission: Impossible had managed to stay away from any comparisons with it’s British MI6 counterpart but the cold opening, a hijack and crashing of a commercial plane, felt like a scene that would open a Bond movie rather than link with the covert operation that was the focus of the original. What happened to the guy from the first movie? This can also be said of Tom Cruise’s character; Ethan Hunt. No longer is he the fresh-faced, out of his depth spy who is struggling to deal with the situation around him. Now he is a vest wearing, muscle-bound action hero. James Bond crossed with Jean-Claude Van Damme. The film continues in this vein throughout. It has a slow start as Cruise attempts to recruit the generic love interest who he manages to bed within three scenes and cringe-worthy innuendo. The bad guy is so “villain-by-numbers” that it could have been played by any British actor from the early 90s. Dougray Scott doesn’t do a bad job, he just plays the same bad guy Alan Rickman and Jeremy Irons perfected years earlier. The generic action movie focus continues with the set-pieces too. We get the whole range, from motorbike chase, car chase round a canyon, Ethan Hunt against an army of henchmen and of course, the customary repeat of the most memorable part of the first movie – the quick descent on a wire. They are done very well but they have been seen far too many times before. 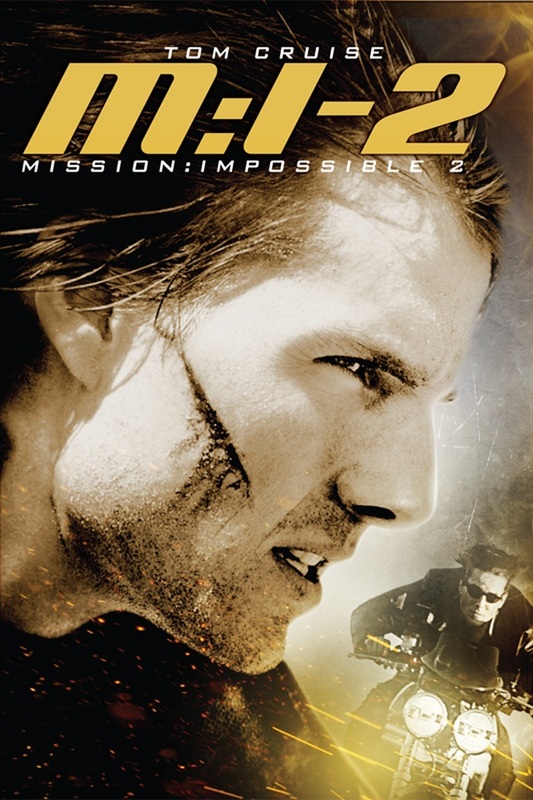 That is how to best describe Mission: Impossible 2. It offers very little that is new but does everything recognisable very well. The action sequences are great, some of the dialogue is cheesy but hits it’s mark, particularly if delivered by Anthony Hopkins, and the iconic theme tune is used effectively to give the movie it’s pace and punch. It is like Tom Cruise asked John Woo to make him Mission: Impossible and John Woo pulled out all his usual tricks. So we get slow motion, quick zooms and dramatic looks and of course, doves! You can’t argue with what John Woo delivered because it is a solid package. 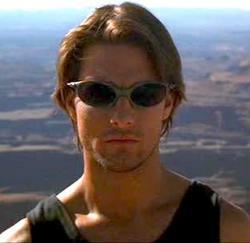 Mission: Impossible 2 is a very good action movie. It will give you the mindless, popcorn fix that Die Hard or Con Air did as well but as a sequel to the accomplished, fantastic spy movie that started this series, it fails on every mark.